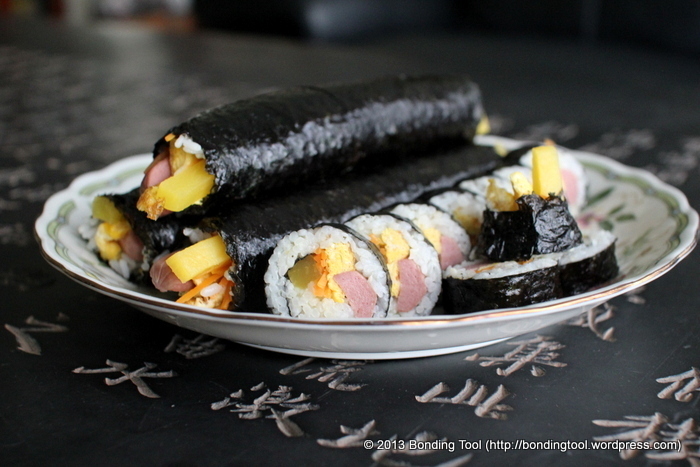 Kimbab and Futomaki are seaweed wrapped rice with pickles and other fillings and the similarity stops here. I’m sure you can wiki more information on their differences so I’ll just dive into the making of my first kimbab with Valerie, as my Korean cuisine teacher. Cook 3 cups of Korean short grain rice in a rice cooker with water level mark 3 (same way as you cook Jasmine rice). Once cooked and whilst hot, sprinkle a pinch of salt and ¼ teaspoon of sesame oil into the rice and fluff to mix well. Set aside. Beat eggs and season with a little salt to make omelet. The thickness is up to you. We like our eggs fat and wide. Saute the carrot julienne strips with a little sesame oil for 3 minutes. Boil spinach till limp, drain, squeeze away excess water and season with a little salt and sesame oil (we did not get spinach today but they will certainly make the kimbab more colourful and appealing plus you can that extra mineral, iron, in your diet. Boil canned or frozen sausages in water till cooked. Slice into half lengthwise. 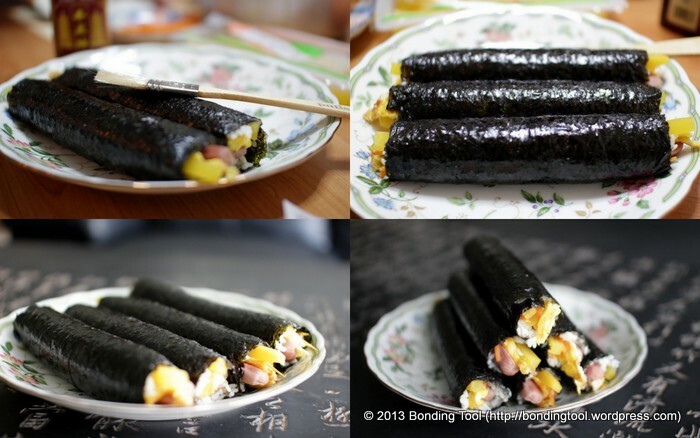 Look at the pictorial steps above and start rolling and squeezing until you get a kimbab log. 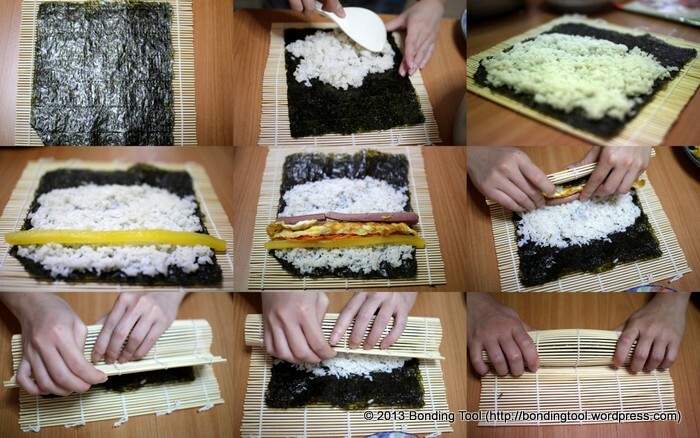 Place a piece of kimbab seaweed on the bamboo mat. Put few tablespoons of rice on the seaweed and spread them into a thin layer leaving about an inch of margin for sealing later. 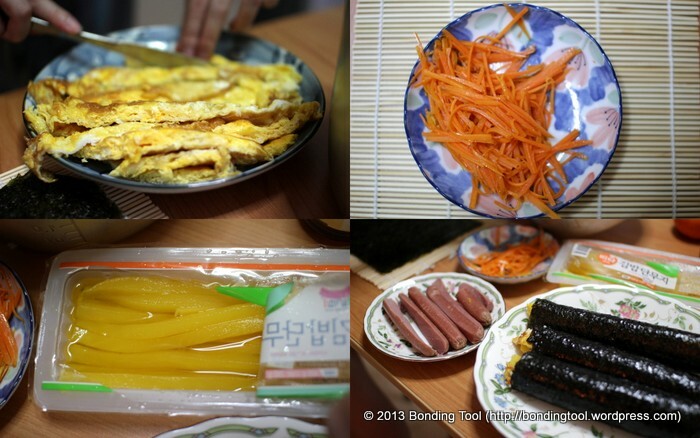 Place one dan-mu-ji (Korean pickle), some carrots, one omelet strip (spinach, missing here) and sausage halves. 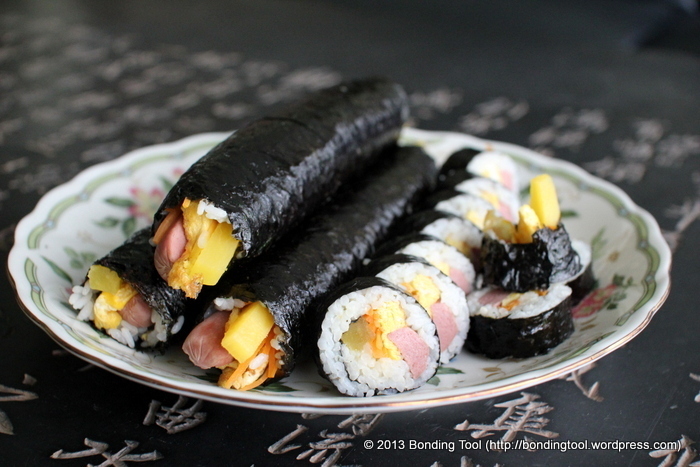 Roll, press tightly into log shape, release mat, and repeat until the kimbab is formed and sealed. 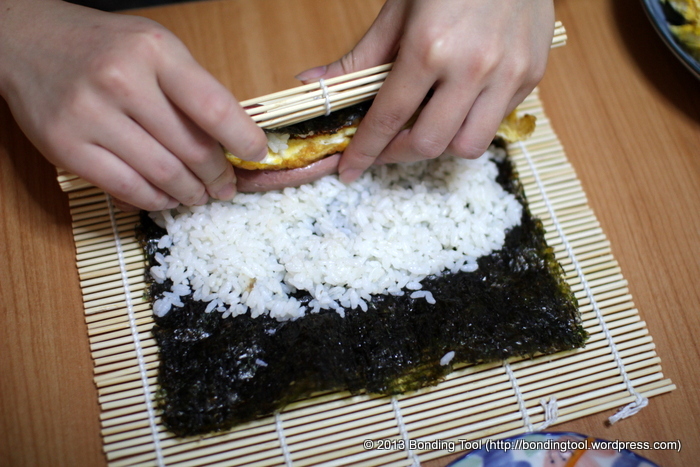 Once the kimbab is filled and rolled, brush very little sesame oil to moisturise the seaweed. 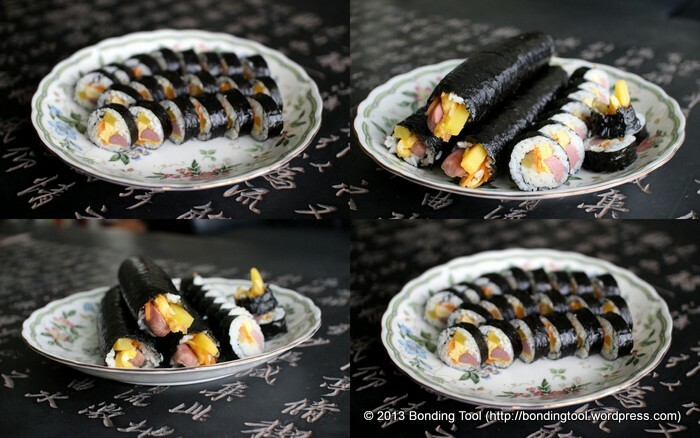 This gives the kimbab extra flavour, shiny good look and also makes slicing easier. Kimbabs are usually wider and thinner. 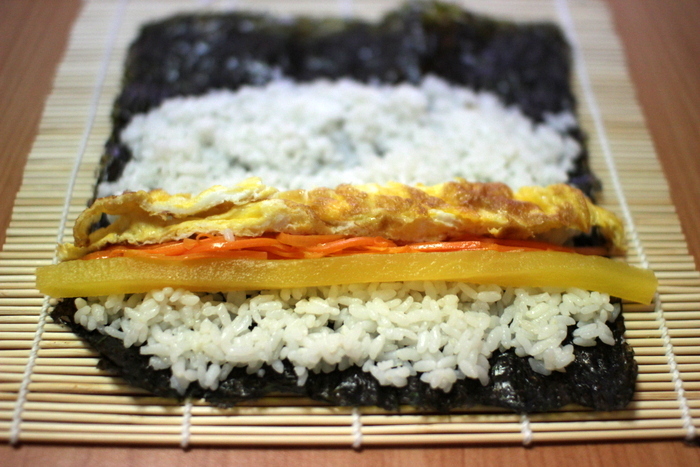 Using your finger’s width as a guideline, slice the kimbab that thick. Kimbabs are eaten without any dipping sauce, wasabi or sushi ginger so do season with salt and sesame oil according to your taste before assembling. 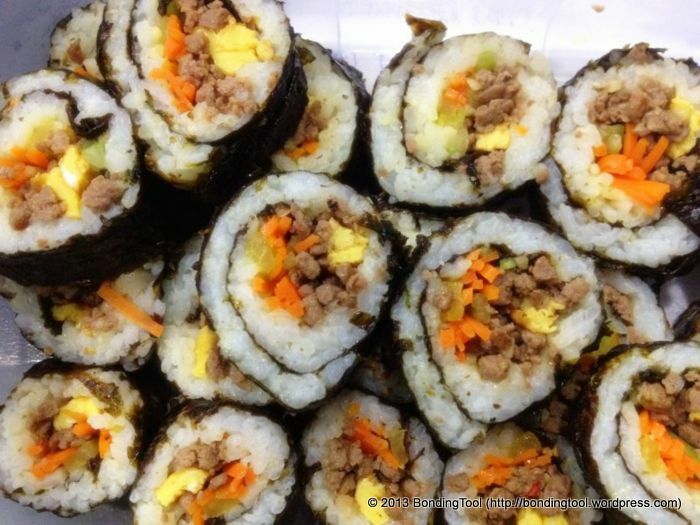 Above is the Beef Bulgogi Kimbab, Valerie, made when I was away weeks ago. 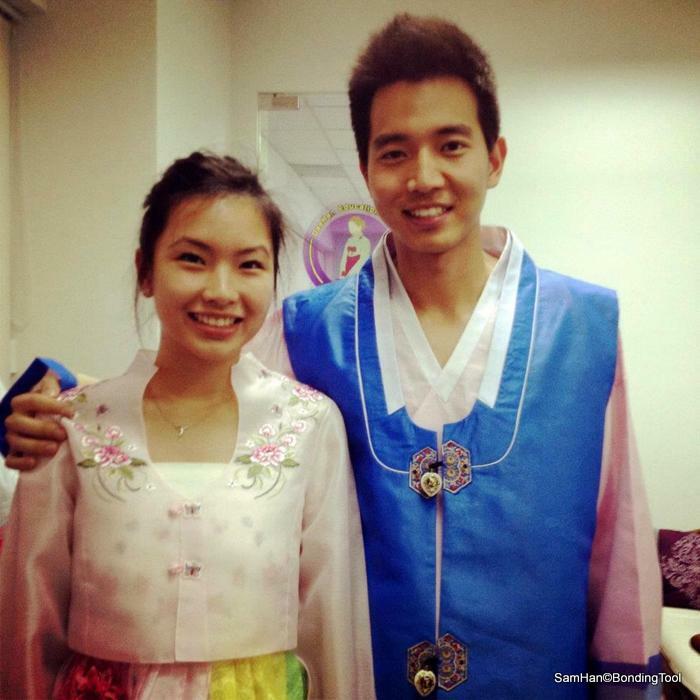 Valerie and Seong in traditional Korean costumes. Cook Korean Rice as per normal but with slightly more water, season with a hint salt and sesame oil. Let cool to body temperature. Meanwhile prepare your “feelings”… What do you feel like having? Spinach (pre-boiled and seasoned in sesame, salt and oil). Carrot (pre-boiled in soy sauce). Omelet (season with a little salt before frying). Spam, cut into thick match sticks. Sausages, cut lengthwise (not gourmet sausages). Cooked Octopus, diced (boil octopus in salted water till tender). Kimchi, press and drain away excess liquid, and chopped. Tuna, press and drain away excess liquid (chamchi). Tuna and Mayonnaise or Spicy Tuna? 잘 막겼습니다 (I hope you’ll eat well).